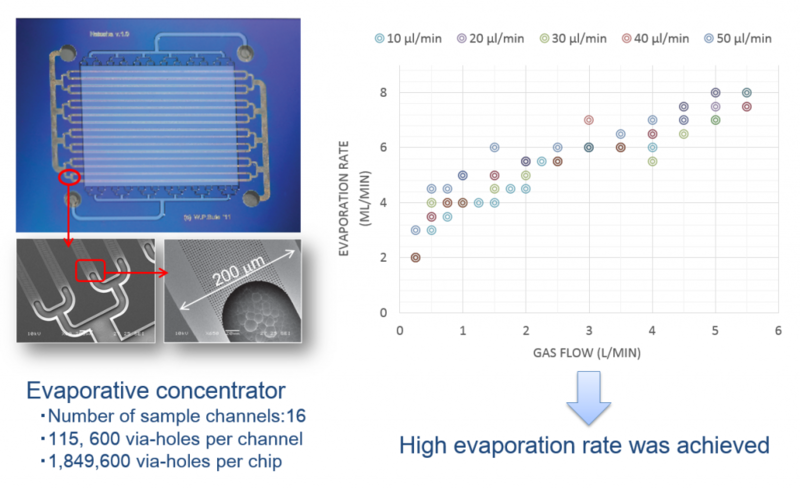 The concept of evaporative concentration was proven by a single-line chip. Here we discuss the follow-up design, fabrication procedure and functional tests of a multiline evaporative sample concentrator integrated with a 3D printed polymer manifold platform. In contrast to previous work, 20-fold enhancement of evaporation rate is demonstrated. The 16-lines device consists of a silicon-rich nitride (SiRN) membrane perforated with ~1.86 million micromachined via-holes (600 nm in radius), which forms the contact between a liquid channel and an overlapping evaporation chamber (Fig. 1). The liquid evaporates through the grid of via-holes, and its evaporation rate is enhanced by effective renewal of saturated vapour layer at gas-liquid interface. A rapid prototyping technique (additive 3D printing) was applied to encapsulate silicon-glass chip within polymer manifold in semi-permanent manner. The temperature stabilization and monitoring of evaporation rate was provided by controller based on open-source Arduino electronics prototyping platform (Fig.3). The proportional-integral-derivative (PID) loop was software-implemented in 8-bit RISC microcontroller to stabilize the temperature with variation of 0.1°C. The communication with autonomous controller was facilitated via radio link established by single-chip 2.4 GHz transceivers and Bluetooth module. The chips were tested with respect to their evaporation capability. The influence of the gas flow on the evaporation rate was investigated for various sample flow rates. A very high water evaporation rates were achieved. An evaporation rate of 10 µL/min, achieved in mild conditions, compatible with biological sample treatment (T≤37°C), allowed for 4-fold sample enrichment. High-throughput flow ability and >30-fold concentration factor achieved in temperature of 50°C facilitates the application of presented prototype also for chemical sample enrichment. Microfluidic Integrated Circuits Research Laboratory (c) 2014.